Fillings are materials placed in the teeth to replace parts of a natural tooth and are commonly used to fix broken teeth. The most common cause of tooth destruction is dental decay (dental caries), a bacterial induced process that dissolves the tooth. However, other common issues such as erosion, a process whereby tooth tissue is dissolved by acid either from your diet or by regurgitation, and abrasion caused by mechanical wearing of the teeth eg over-vigorous tooth brushing. Bruxism (tooth grinding) will also damage teeth. The loss of tooth tissue caused by these processes can result in pain due to the exposure of the sensitive parts of the tooth called the dentine and pulp. Filling are the most common treatment for broken teeth. More heavily fractured teeth may require more extensive restorations such as veneers, onlays or crowns. You can read below to learn more about these different treatments. Amalgam: This is the oldest and still most common material used for replacing large amounts of missing tooth tissue in back teeth. It is a mixture of various metals such as silver, copper and mercury. There has been a great deal of concern about the use of amalgam over the years, mostly due to the mercury content. Although mercury is poisonous in its purest form there have been no conclusive scientific studies which have proven the negative affect of amalgam fillings on the human body. There have been reports of allergic reactions to the constituents of amalgam but these are very uncommon. The main advantages of amalgam is that it has a proven track record as a long-lasting material and can be placed very quickly. The disadvantages are that it is grey in colour and does not bond/adhere to teeth, unlike some of the other filling materials. Composite: Dental composite is a mixture of acrylic and quartz and is tooth coloured. Considerable advances have been made in the technology behind dental composites and in certain cases they can bond to the tooth, which is an advantage. They are generally more difficult to use compared to dental amalgam and in large cavities can lead to stress within the tooth, which may cause post-operative sensitivity. This usually passes after a few days. Dental composites are very good for filling front teeth because of their ability to match tooth colour and can also be used to change the shape of teeth. The bonding capability of the material means that they can be placed in cavities without the need for mechanical undercuts to be drilled into the tooth, thus meaning healthy tooth is maintained. The material is set hard (cured) by a blue light, which gives the dentist time to mould the filling. It is very sensitive to moisture before it has set and the dentist will need to use techniques to prevent contamination before it is set as such contamination will reduce the success of the filling. Glass ionomer: This material is tooth coloured and is made from a form of glass. It sticks to tooth and is more useful for smaller cavities as it has poor strength properties. It is very useful in children's teeth and release fluoride over time which helps prevent further decay. It is sometimes used with dental composite to help seal the tooth. Similar to composite it is very sensitive to moisture before it has set. Glass ionomer cements have also been mixed with metals to improve their strength, although this reduces the aesthetic quality of the filling. Cements: Dental cements can be used as temporary fillings or to secure crowns and other types of restorations to teeth. They can be made from a variety of materials and different cements are suitable for different jobs. A dental veneer is a layer of tooth-coloured porcelain or ceramic which is bonded to and covers the surface of a tooth. They are generally used at the front of the mouth and are used for a variety of reasons. 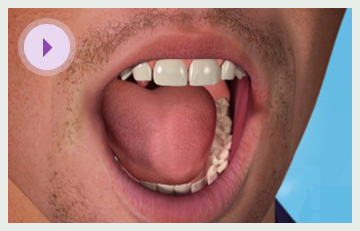 These may include masking a discoloured tooth, repairing a fractured tooth or closing/covering gaps between teeth. Often veneers are lab made but sometimes they can be built-up by hand using white filling material. 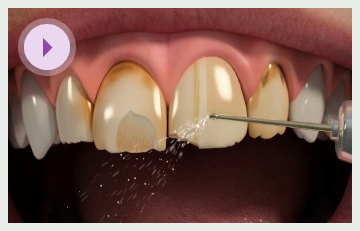 To place a veneer, the tooth will commonly need a very small amount of enamel removed from its surface. This is usually completely pain free. 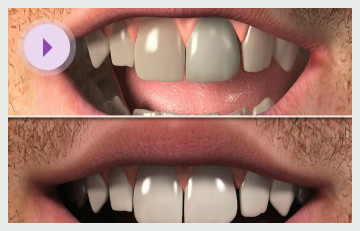 A mould (impression) will be taken of the prepared tooth and the dentist will also choose the colour that the new veneer will need to be in order to match the adjacent teeth. This information will be communicated to a dental laboratory who will construct the veneer. Until the veneer has been made the tooth may be more sensitive to hot and cold. Sometimes a temporary veneer is placed over the tooth to protect it. At a later appointment the veneer will be glued/bonded to the tooth. Veneers are best avoided in situations where the basic rules of dental hygiene are not observed. Compared with a crown (cap), less of the tooth needs to be drilled away. Veneers are relatively quick and simple, although they require as much planning and attention to detail as any other treatment. Sometimes when a cavity is very big a conventional filling is not mechanically strong enough to withstand the pressure of the bite. In these situations a lab made restoration such as a inlay/onlay or crown will often be a more successful solution than a filling. An inlay is useful in situations where a filling is not strong enough and as the name suggests it fits inside the tooth. An onlay covers the top of the tooth and is used for worn teeth, or where the remaining tooth needs strengthening to prevent it breaking away. Sometimes a combination of both is used. They are created in a dental laboratory and cemented into or on to the biting surface of a tooth. They can be made of gold, non-precious metals, porcelain or special ceramics. The choice depends on the position in the mouth in which they are to be placed, the strength of the bite, whether the patient grinds their teeth, and to some extent the wish to have a tooth coloured filling. There restorations normally take two visits to place: The first is the preparation of the cavity and the taking of an impression of the prepared tooth and of the opposing teeth so the bite can be made correctly. A temporary filling is often placed whilst the laboratory creates the restoration. The second visit is to cement the restoration in. The tooth may need to be numbed to prevent discomfort during the cementation process as the tooth will need to be vigorously dried. There could also be a need for some minor adjustments to the bite. As there two stages are required and complex laboratory work is needed onlays are more expensive than ordinary fillings but less than crowns. An average figure for their life-span is around 15 years although if the general health and hygiene of the mouth is good the life of such as restoration could be much longer. Generally onlays will have a longer life-span than a filling. Chipped or fractured teeth, broken down fillings, or teeth that are malformed or discoloured are all conditions which can affect the look and function of your teeth. A crown is a cap that is used in order to help restore or protect a tooth that has been chipped or damaged. Crowns can also cover a large filling to help keep it in place, and they are commonly used to protect a tooth which has undergone root canal treatment. Teeth are also sometimes crowned in order to anchor an artificial tooth which is being used to replace a missing tooth. This is known as a bridge (which you can read more about in the 'Replace my missing teeth' section). The general purpose of a crown is to restore a tooth to its normal shape and size, while both strengthening and improving its appearance. Tooth-coloured porcelain attached to a durable metal shell is the most common construction used to create a crown because this is a very mechanically strong combination. However, a crown can also be made of gold alloys or non-precious alloys, ceramic, acrylic (plastic) or composite resin, or sometimes a combination of these materials. Tooth positon, the height of the gum tissue, the amount of tooth that shows in the smile, the colour and strength of the natural tooth, and the function of the tooth are all taken into consideration when choosing which material to use. Having a crown fitted usually requires two appointments to be fitted. At the first appointment, the tooth to be crowned will be numbed and shaped in order to accommodate a crown, and then a mould of your tooth will be taken for the laboratory to use in the manufacture of the crown. 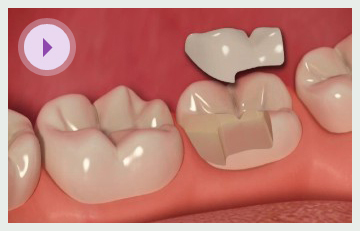 A temporary crown will constructed and placed over the tooth until the permanent crown is ready. Crowns are permanent restorations but they can occasionally come loose and need to be re-cemented. However the life-span of a crown is most heavily dictated by how it is cared for- the general hygiene of the mouth must be maintained to optimise the life-span of this type of restoration.